In this monthly blog series, our collections team write about their Object of the Month, chosen from our collection. In this blog post, Curator Naomi Collick discusses the symbolism of this Chinese Buddhist ewer. This water ewer would have been used as a visual aid and tool in Buddhist ritual. Buddhism is a religion that takes its name from the title ‘Buddha’, meaning ‘enlightened one’. The Buddha, whose teachings inspired the religion, was a prince called Siddhartha Gautama. He is believed to have lived around the 6th or 4th centuries BC in the eastern part of ancient India. He became a travelling sage and teacher, promoting his new concept of ‘The Middle Way’. This was a way of living that was more moderate than the one traditionally chosen by monks at the time. Ancient Indian monks or sages believed that severe self-discipline, fasting, and hardship was the path to ‘enlightenment’ and way to escape the endless cycle of reincarnation and suffering. Siddhartha promoted a life that was neither luxurious nor extremely difficult. He is said to have taught the ‘Four Noble Truths’, which outlined the idea that you can escape the suffering of the world through self-cultivation. He also taught the ‘Eightfold Path’, which outlined the correct ways to think, act, speak, and so on. He is believed to have become an enlightened ‘Buddha’, with a complete understanding of the true nature of the world, whilst meditating. A few hundred years after Buddha died (or achieved ‘parinirvana’, the final escape from suffering and reincarnation), an Indian king called Ashoka became the first Buddhist ruler. According to ancient texts, he sent Buddhist missionaries out across the world to promote the religion. Buddhism is believe to have reached China in the third century BC. 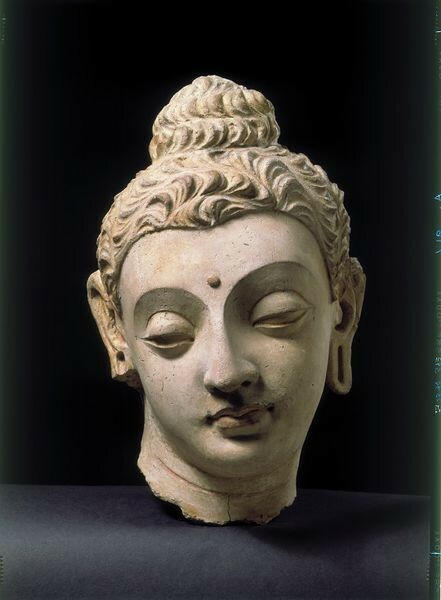 Sculpture of the head of the Buddha Siddhartha Gautama, Stucco with polychrome, 4th century, Afghanistan, The Victorian and Albert Museum, object number IM.3-1931. 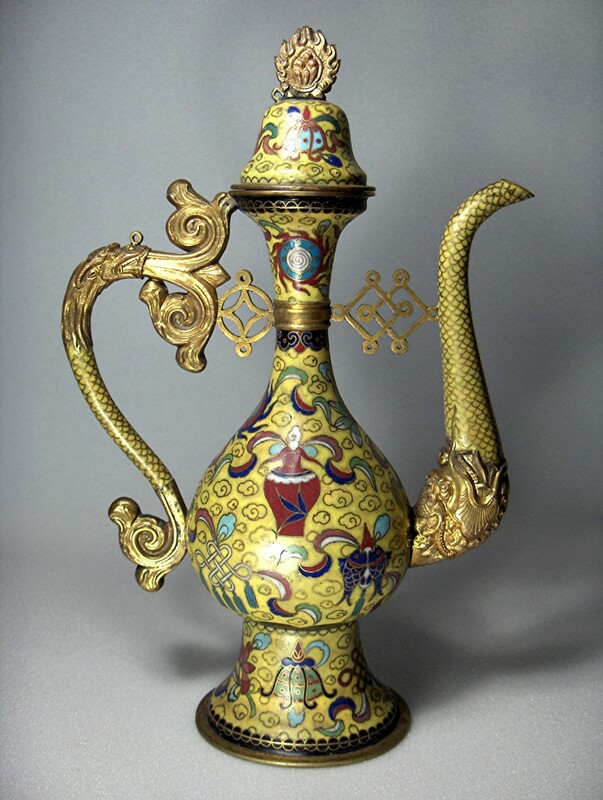 The symbols decorating this Chinese cloisonne ewer indicate its use in Buddhist ritual. 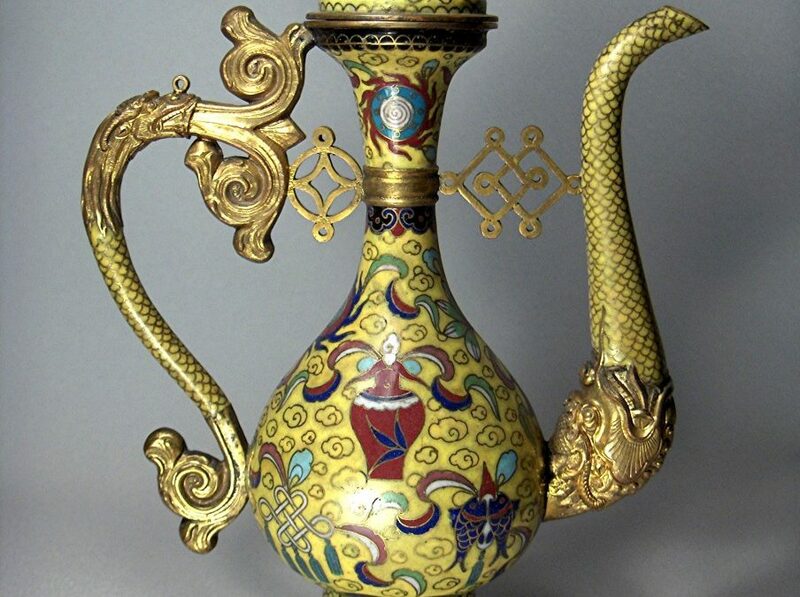 The ewer is decorated with the Bajixiang, the Eight Buddhist Emblems, including the Wheel of the Dharma (teachings of the Buddha), the conch shell, the victory banner, the parasol, the lotus, the treasure vase, the paired fish, and the endless knot. Symbolism and diagrams play a very important part in Buddhist ritual objects. They remind practitioners of the key teachings of the Buddha, and they help to focus the mind during meditation. The Wheel of Dharma represents the endless renewal and continuation of the teachings of the Buddha. The lotus symbolises the escape from the suffering of the world, just as a lotus rises up from the mud of a pond. On top of the lid of the ewer is a flaming triple jewel. 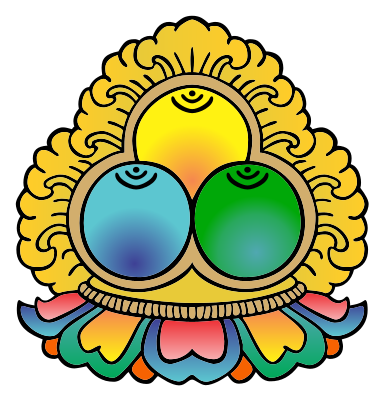 The three jewels represent the Buddha, the Dharma (his teachings), and the Sangha (the community of monks). 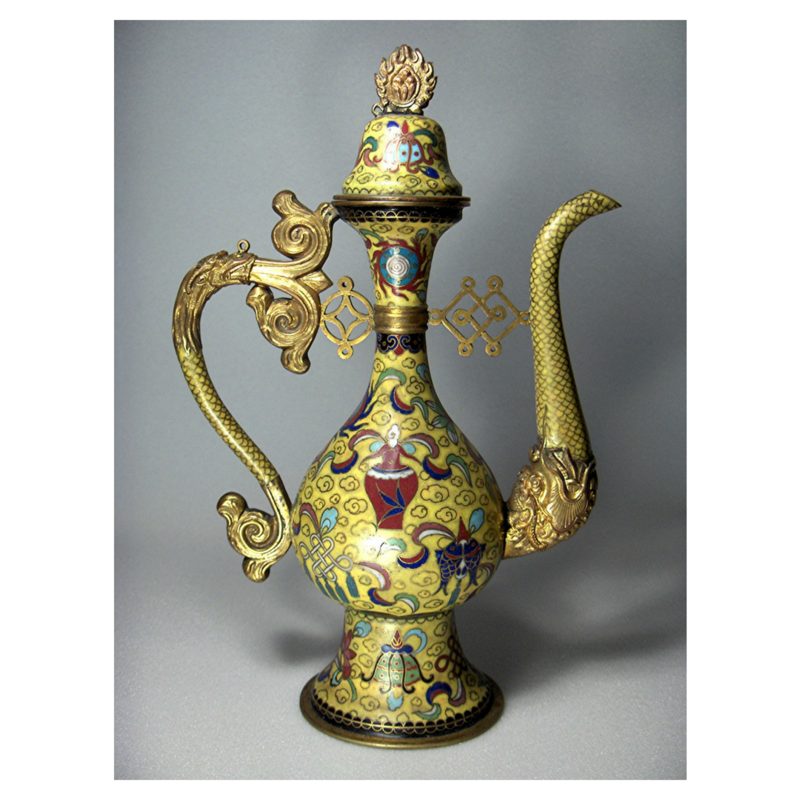 Today, objects such as this ewer are considered to be works of art, appreciated for their aesthetic value. However, this ewer was originally made as a ritual tool, with each part of the design and colours selected as symbols and reminders of Buddhist beliefs. It would have been used to pour water as an offering. Water is one of the offerings considered appropriate for a Buddhist altar, along with food, flowers, incense, and light. 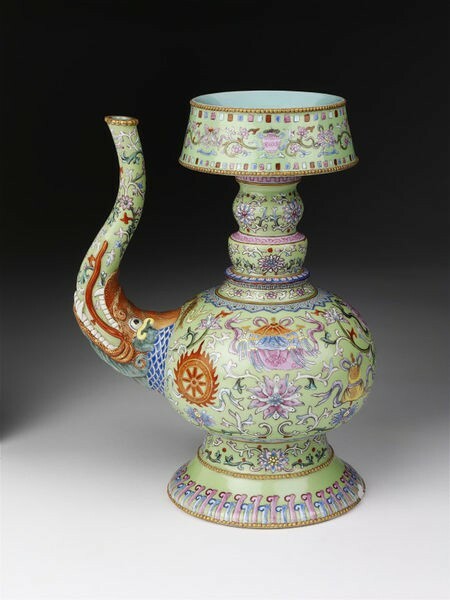 The traditional Buddhist water ewer, the kundika, came from India along with Buddhism and was used in China since at least the T’ang dynasty (618 - 907 AD). The water ewer became associated in China with the Bodhisattva of Compassion, Guan Yin, as it symbolised purity and healing. According to the brand of Buddhism practiced in China, Mahayana, Bodhisattva are beings who inspire and guide people on the path to enlightenment. They represent the key virtues of the Buddha, such as compassion and wisdom, and are considered to be the Buddha’s attendants. Guan Yin is one of the most important Bodhisattva in China. The Eight Buddhist Emblems motif originated in India and was introduced into China by Tibetan Buddhists in the early 14th century. 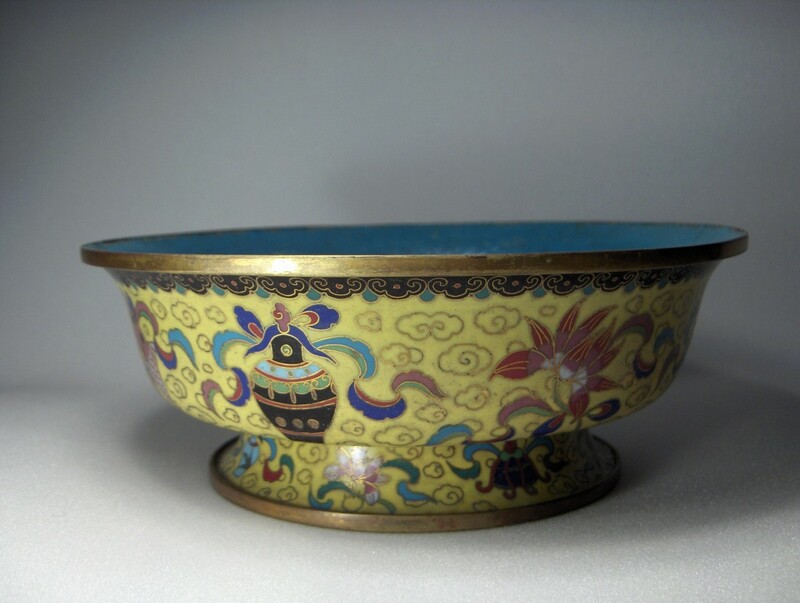 It became a very popular motif for porcelain and cloisonne ritual wares. An 18th century enamel Buddhist water ewer in the shape of a traditional kundika, with Eight Buddhist Emblems design, Chinese. Victoria and Albert Museum, Object number CIRC. 139 - 1032. 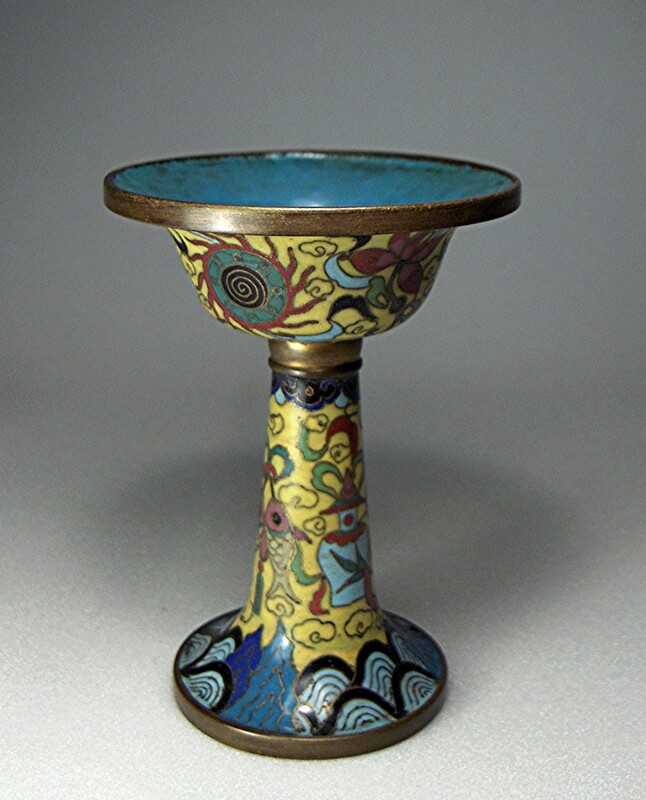 The Chiddingstone Ewer is part of a three-part cloisonne altar set, along with an offering cup and bowl. They would have been used to make ritual offerings of water, food, and perhaps flowers. According to an old label written by Denys Eyre Bower (1905 - 1977), the collector of all the objects at the castle, the altar set was given by the ‘Tashi Lama of Tibet’ to the Viceroy of India, Lord Minto, in 1908. The ‘Tashi Lama’ is the old Western term for the Panchen Lama, one of the most important leaders in the Gelug Tibetan Buddhist school. The Panchen Lama, is the second in spiritual authority only to the Dalai Lama. If this provenance is correct, this altar set would have been considered appropriate as a gift given by one of the most important figures in Tibetan Buddhism. See this fascinating object on display in our newly reopened Buddhist Room. Chiddingstone Castle is an historic house, set in 35 acres of Kentish countryside, filled with treasures collected over a lifetime by Denys Eyre Bower.